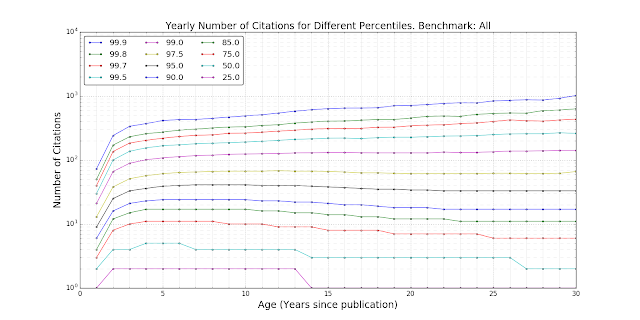 A few weeks ago we had a discussion about citations, and how we can compare the citation impact of papers that were published in different years. 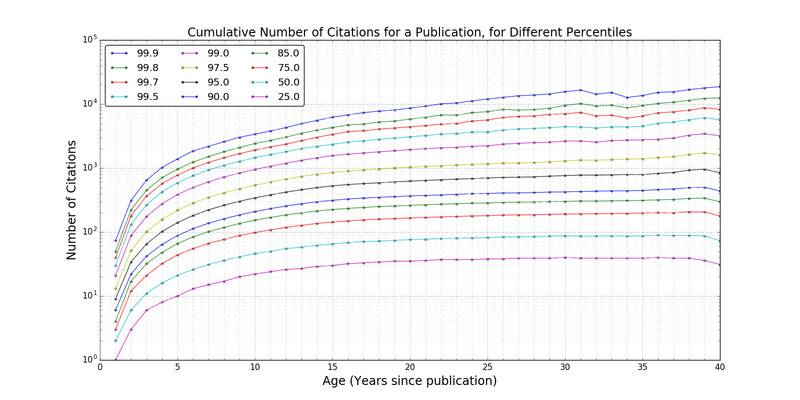 Obviously, older papers have an advantage as they have more time to accumulate citations. This process got me curious though. Can we tell how a paper is doing at any given point in time? How can we compare a 2-year-old article, published in 2016, with 100 citations against a 10-year-old document, published in 2008, with 500 citations? To settle the question, we started with the profiles of faculty members in the top-10 US universities and downloaded about 1.5M publications, across all fields, and their citation histories over time. We then analyzed the citation histories of these publications, and, for each year, we ranked the papers based on the number of citations received over time. Finally, we computed the citation numbers corresponding to different percentiles of performance. The plot below shows the number of citations that a paper needs to have at different stages to be placed in a given percentile. A few data points, focusing on certain age milestones: 5-years after publication, 10-years after publication, and lifetime. We also wanted to check at which point papers reach their peak, and start collecting fewer citations. The plot below shows the percentiles based on the yearly numbers of accumulated citations. The vast majority of papers tend to reach their peak 5-10 years after publication; the number of yearly citations starts declining after 5-10 years. There is an interesting effect around the 97.5% percentile: After that level, it seems that a 'rich-gets-richer' effect kicks in, and we effectively do not observe a peak year. 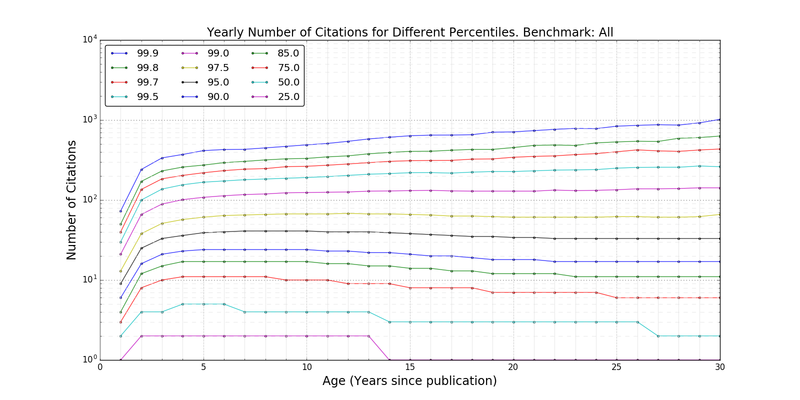 The number of citations per year keeps increasing. You could call these papers the "classics". What does it take to be a "classic"? 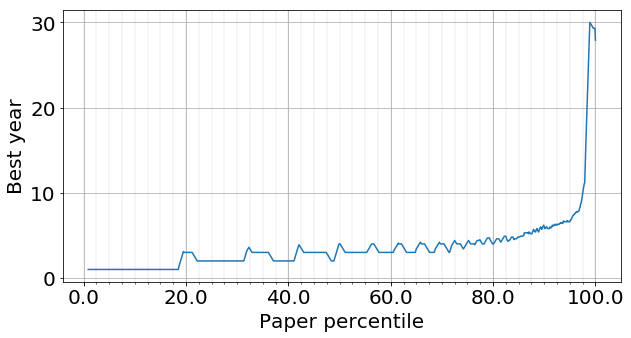 200 citations at 5 years or 500 citations at 10 years.